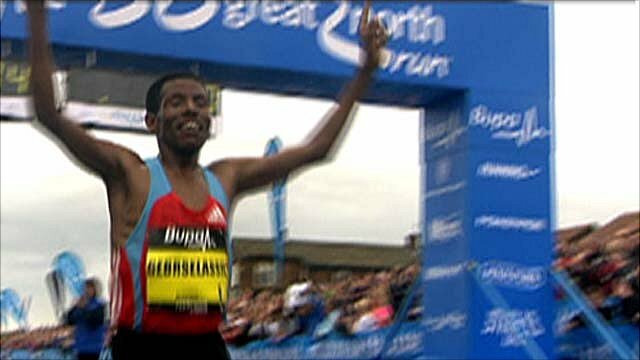 Ethiopia's Haile Gebrselassie powered to an emphatic victory in his first Great North Run in Gateshead on Sunday. The two-time Olympic 10,000m champion was unable to threaten the 2005 course record of 59 minutes 05 seconds. But the marathon world-record holder, 37, surged clear at halfway to win by a huge margin from Kenya's Kiplimo Kimutai in a time of 59:33. Fellow Ethiopian Berhane Adere won a tough women's race, with British runner Mara Yamauchi fifth. Gebrselassie was fulfilling a long-time promise made to race chairman Brendan Foster by taking part in the race. In the 30th running of the event, run in cool, overcast conditions, the half marathon world record-holder finished 1:50 ahead of Kimutai with Morocco's Jaouad Gharib third. "It was wonderful," Gebrselassie told BBC Sport. "I needed someone to keep the pace until the last 2km and maybe then it would have been faster, but I was on my own most of the race. "What is important is to win - the Great North Run is very special. "I have been dreaming for many years of racing here. I kept promising that I would come and finally I've made it." His compatriot Adere, who won the women's race in 2006, pulled clear with two miles remaining and finished in 68:49 to beat Portuguese duo Ana Dulce Felix and Marisa Barros. Yamauchi, Britain's leading woman runner, was unable to keep up with the pace but was happy with her time of 70:39 as she builds up towards a tilt at November's New York Marathon. "It was a reasonable time," the 36-year-old told BBC Sport. "I was hoping to go a little bit quicker but hopefully in another month I'll be going quicker." Andrew Lemoncello was the leading British male, finishing in ninth place in 63:48. Britain's Paralympic medallists David Weir and Shelly Woods won the men's and women's wheelchair races. Weir held off Canada's Josh Cassidy, who pipped him to the line in April's London Marathon, to win the event for the fourth time in 44:49 while Woods chalked up her third triumph in 52:59. Around 54,000 runners took part in the race from Newcastle to South Shields.